Karachi: Chief of the Naval Staff Admiral Zafar Mahmood Abbasi has emphasized that whenever a nation relies on foreign aid, the urge to attain self reliance tends to fade away. The Naval Chief was speaking as a chief guest at the Annual Award Ceremony of Pakistan Navy Logistics Command at PN Dockyard Friday. Annual Award Ceremony is held at the end of every year to review overall performance of the units under the command and to acknowledge their efforts in successful completion of various projects. 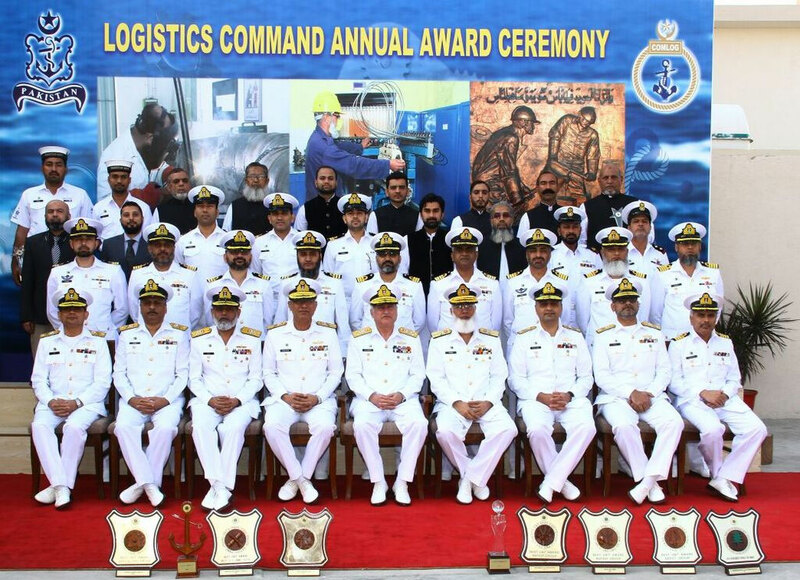 Speaking on the occasion, Chief of the Naval Staff lauded the professional acumen of the Logistics command of Pakistan Navy for undertaking all the professional tasks with utmost excellence. The operational readiness of PN Fleet and its participation in various exercises during 2017 speaks volume of the efforts of Pakistan Navy Logistics Command, he added. He emphasized that whenever a nation relies on foreign aid, the urge to attain self reliance tends to fade away. Our desire to achieve self sufficiency is fully alive and our endeavours towards self reliance and indigenization bear testimony to national pride and manifest our dedication towards service. Admiral Abbasi further said that despite external pressures, we need to tackle our internal affairs judiciously and move forward with a positive approach. He said that we are a resilient nation. Our Armed forces are fully geared up to meet internal and external threats and challenges. The Admiral underscored that a modern and strong Navy is not only needed to keep our homeland safe but also to ensure regional maritime stability. To make Pakistan Navy a modern and potent force, induction of new platforms in PN Fleet and technical capability to maintain and upgrade them is as significant as availability of skilled and professional manpower. In this regard, Pakistan Navy has acquired new platforms equipped with latest technology to further strengthen its offensive punch. The Naval Chief stated that besides modernizing PN Fleet; Pakistan Navy is cognizant to equip its human resource with best training and introduce them to emerging technologies. Skilled and adept human resource is our asset and we are proud of our men. Admiral Zafar Mahmood Abbasi emphasized that following the golden principles of Islam as guiding lights in our professional and personal life, we will take Pakistan Navy to the new horizons of capability, capacity and readiness. Later the Chief Guest gave away awards to best units and personnel for their remarkable performance and achievements.